Learning to drive has never been so easy and enjoyable! 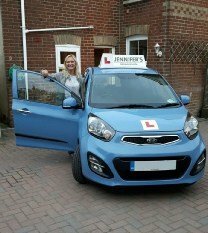 If you want to try learning in an automatic or would like refresher automatic driving lessons, Tracey covers some areas of Bournemouth and all of Poole and surrounding areas. Tracey is not only a driving instructor but also a life coach/hypnotherapist and is extra good with nervous or anxious pupils. She has many techniques to help nervous or anxious pupils on their lessons or on test day. She has coached people who are wracked with nerves and has helped anxious people through their test to pass with flying colours. She is a high grade and very experienced driving instructor. Tracey is very popular and gets quite booked up so if you would like to book in with her, contact us now. As with all of our lessons, we provide value for money driving tuition getting you through your test at your own pace, whether that is as quickly as possible or taking your time. Automatic driving lessons in Bournemouth are £30 per hour. Tracey cannot fit in ‘intensive’ driving lessons as she gets too booked up. This is Kath who passed her automatic driving test after just 19 hours of tuition with Tracey with absolutely zero driving faults (a clean sheet!). You can’t get better than that. And she was extremely nervous to begin with. Will you be next?